Stricken townspeople swept away the wreckage of a fuel truck bomb that killed 98 persons in south of Baghdad as three more suicide car bombers struck the Iraqi capital today in a relentless new campaign. Seventeen foreign militants of the Al-Qaeda terror network have been killed in a gunbattle with security forces, who arrested 16 of their local collaborators in the North Waziristan tribal belt of Pakistan, the army said today. The British police has released a chilling photograph of the four young men who bombed London last week which shows them trudging into a train station on the morning they detonated their explosives. Mohammed Sidique Khan, one of the four suicide bombers who carried out last week’s explosions here, was scrutinised by Britain’s intelligence agency MI5 last year but let off after he was judged not to be a “threat” to national security, a media report said today. Foreign Ministers of G-4 countries, including External Affairs Minister K. Natwar Singh, are here for crucial talks with their African counterparts during which they will try to reconcile differences on their resolutions on the expansion of the UN Security Council. In escalating violence in the Gaza Strip, Israeli troops shot dead a Hamas commander and Palestinian militants continued to hit settlements in the area injuring four persons in a mortar attack. The overnight attack, which devastated the highway town of Musayyib, was the deadliest since the new Iraqi Government took power in April. Yesterday’s bombing prompted denunciations of the authorities in Parliament and calls for local militia to take up arms. Some 15 suicide bombers have struck within just over 48 hours in the capital and along the highway heading south in what al-Qaida’s Iraq wing has declared is a new campaign to seize the control of Baghdad. By far the worst incident was the blast near a Shia mosque, which caused devastation in the mixed Sunni and Shia town, in the centre of a violent area dubbed by US forces the “triangle of death”. A suicide bomber blew up a fuel truck near a crowded vegetable market outside the mosque. In addition to the 98 killed, hospital sources said 75 wounded were being treated, including 19 in a serious condition. Today, angry crowds railed against the authorities outside buildings gutted by flame, while bulldozers swept aside the burnt-out wreckage of cars. At a tense session in Parliament, politicians assailed the government for failing to maintain security and called for local militia to be formed to replace failed police and soldiers. Al-Qaida in Iraq, which has urged hundreds of suicide bombers from across the Arab world to come to Iraq to wage the holy war, has claimed responsibility for the latest bombing campaign and said more violence would follow, although it did not explicitly claim the Musayyib attack. Today began with three more suicide car bombs in the capital, police sources said. One attack, at a police checkpoint in the east of the city, killed three and wounded 14. The second, at a checkpoint in the south, killed one and wounded three. 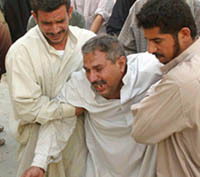 The third, near the former election commission headquarters, killed three and wounded two. Al- Qaida had claimed responsibility for two attacks by late morning. Pakistani security forces cordoned off an area south of Miran Shah in Waziristan last night after a tip off about the presence of foreign militants in a few isolated compounds, Major-Gen Shaukat Sultan told reporters here. After protracted negotiations for surrender, the militants believed to be from Turkmenistan and other Central Asian Republics tried to flee in some vehicles following which the troops confronted them. When confronted the militants tried to attack the troops with heavy weapons. One woman even threw a grenade at them resulting in the death of one of the soldiers, General Sultan said. In the ensuing gunbattle, troops killed the militants and overpowered a few others who were injured. As many as 16 local facilitators had also been apprehended by the security forces, the spokesman said. A huge amount of arms and ammunition, including detonators and explosive material along with switches, circuit diagrams and written instructions to make IEDs had been recovered from the house, a defence press release here said. One newspaper said British officials had checked out one of the four last year but concluded he did not pose a threat. As the investigation into the bombings continued in Pakistan and Egypt, Scotland Yard detectives published the picture in a bid to jog memories and garner more information from the public about the men’s movements on the morning of the attacks. 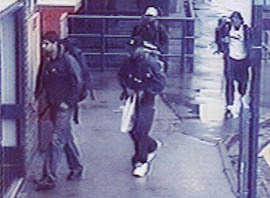 The photograph, taken from CCTV footage, shows the men walking into a railway station in Luton, just north of London, to take a train to the capital. The four are dressed casually and look relaxed, with their hands in their pockets. Each carries a backpack, thought to contain the bombs which tore through London’s transport system during last Thursday’s rush hour, killing 55 persons. The time code on the picture shows it was taken at 7.21 am 1151 hrs Ist, 89 minutes before three of the bombs went off in quick succession at three subway stations. The fourth blast tore apart a double-decker bus nearly an hour later. Khan, a 30-year-old teaching assistant from Dewsbury, West Yorkshire, who killed six other passengers when he blew himself up on an underground train at Edgware Road, was the subject of a routine threat assessment by MI5 officers after his name cropped up during an investigation in 2004, a senior government official said yesterday. But Khan was judged not to be a threat to national security and thus MI5 failed to put him under surveillance, the official was quoted as saying in The Sunday Times. The inquiry focussed on an alleged plot to explode a 600-pound truck bomb outside a target in London, thought to be a crowded Soho nightclub. The intelligence agency had found out in 2004 that Khan had been visiting a house used by a man who had met one of the suspected truck-bomb plotters. However, MI5 officers subsequently decided that because Khan was only “indirectly linked” to one of the bomb suspects, he was not considered a risk and the intelligence service took no further interest in him, the report said. The government official said a “quick assessment” had been made of Khan at the time and like hundreds of others linked to the inquiry, he was judged to be “on the periphery” of the suspect cell’s network. “You made quick assessments of them to decide whether or not they were a threat. None of the other people were a threat, including Khan,” he was quoted as saying in the newspaper. The official conceded that MI5 might be accused of being at fault if it turned out that it had overlooked a terrorist suspect. The G-4, comprising India, Brazil Germany and Japan, have already moved their resolution in the UN General Assembly while Africans have also tabled one and are planning to move it tomorrow. Diplomats were hopeful on the eve of the meeting yesterday that they would be able to smooth out the path for a vote in the General Assembly within a week or so on the expansion of the Council. External Affairs Minister K. Natwar Singh arrived here yesterday especially for the luncheon meeting with his counterparts from G-4 and Africa and is scheduled to leave for Washington to join Prime Minister Manmohan Singh, who will be arriving there for a visit during which he will meet US President George W Bush. Diplomats expect the meeting to last more than three hours and G-4 ministers might hold discussions among themselves later if they consider that necessary. Saeed Seyam, a Hamas commander in the southern Gaza city of Khan Younis, was hit in the neck while sitting on the roof of his home in a western neighbourhood of the city.